This is such contentious subject and I have signed numerous petitions to stop this pointless practice, at least sales to the general public. We have friends and clients that have ended up having seriously injured and traumatized horses from fireworks, Several have contacted us to say that their horse had to be put down or simply died as a result of these nights of terror for some horses. Some of course just don’t bat an eyelid. My mare seemed to cope with a cannon going off mere meters away but night time fireworks left her on so on edge for weeks after that she just wouldn’t settle and stand in the corner of the paddock with her head up much of the time in a high adrenal alert stance. No one wants that. Make sure that your horses are with their usual paddock mates and in a paddock or yard area that they are comfortable in for the weeks preceding this time. The horse is likely to panic less if it has company, so try not to leave your horse in the field on his own. If leaving your horse in a field, check fencing is OK and remove any objects that could cause injury – some horses cope with fireworks better if they are left out in the field, possibly because they do not feel trapped and can flee the frightening noise. If leaving your horse in the field, make sure that fencing is well maintained and there are no objects in the field that the horse could hurt itself on. Find out when local fireworks are being let off so you can be at the yard or field when fireworks are set off to check the horse is OK. 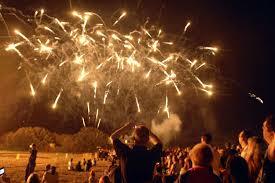 If possible, speak to those intending to let off fireworks so they know horses are kept nearby. They may be able to set fireworks off away from the field or stable. Front load with a short course of St Johns’’ Wort Happy horse 3ml daily from now till 5th November. This will take around 10 days to kick in rather like Prozac and will have the effect of making your horse feel generally more settled. Get your horse used to the same nighttime routine from now until then and make sure that carbohydrates are fed at this time along with half a cup of coconut oil. This will help calm the horse by ensuring the normal production of tryptophan occurs. Protein at this time is not desirable as it will compete with tryptophan production and provide a peak of acetylcholine which you don’t want on those nights. Double dose an hour before night fall on those nights with Anti-Al MAG which will help calm the stress response even further. If you have a stable with electricity get your horses used to having music. Baroque has a more calming effect than say Heavy Metal. There is sufficient research and evidence demonstrating that this will have a negative effect on adrenal production. Get them used to having lights on in the stable which will provide a buffer against intermittent flashes from fireworks. 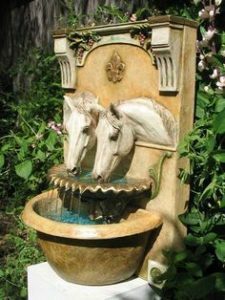 A small circulating fountain in the stable area is calming as it will increase the level of negative ions which is also calming. Remove halters and I prefer to leave the horses without a cover on those nights. Remain vigilant and check on your horses throughout those troublesome nights. If they are soothed by your presence then stay with them. I know of one horse that wouldn’t eat unless her owner sat in the paddock with her. I love it but I can imagine his can be a bit time consuming on an ongoing basis but fine for a few nights a year. Small fountains for inside the Stables . The higher the fall of water the greater level of negative ion production. Explore our website and contact us for further information.